Side dishes always seem to be an issue for me. I seem to go back to the same boring dishes every time. Recently while shopping with my sister she said she has the same problem. She asked me to give her some ideas. I couldn't offer up much help for her. So now I am on a mission to find some great side dishes. We usually have the usual rice, potatoes, mac and cheese, blah, blah, blah. With the warmer weather I am finding we are busier and I need quick ideas. I love to cook, I just hate to spend hours doing it. I purchased a bag of red potatoes because they were on sale so I decided to try something new. I try to always have potatoes around, you can just do so much with a potato. My new favorite thing to have on hand also is a wedge of Parmesan cheese. I have to admit, I always bought it in that terrible can or in a bag already shredded. Never again will I go back to that. There is absolutely no comparison. Depending on the recipes I use it for, it lasts for quite a few dishes. So please, if you are still buying pre-shredded, buy it fresh and do it yourself. You will never regret it. Preheat oven to 350 degrees. 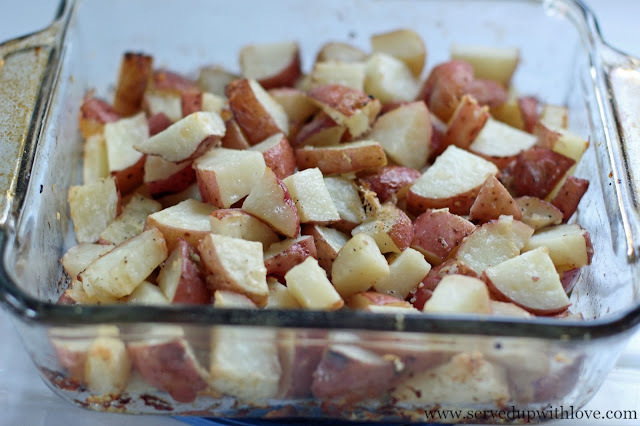 Place potatoes in and 8 x 8 inch baking dish. 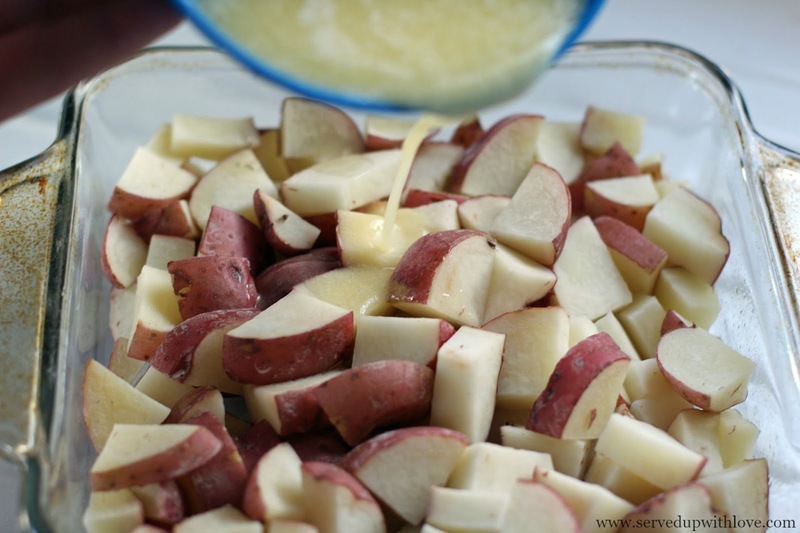 In a small bowl combine butter, garlic, salt, lemon juice and pour over potatoes and stir to coat. 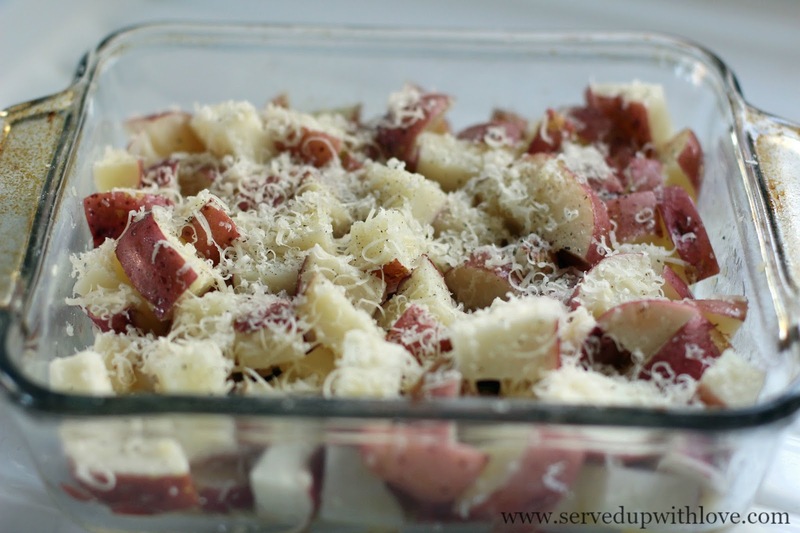 Sprinkle Parmesan cheese over the potatoes. Bake, covered for 45 minutes. Uncover and bake an additional 10 minutes, or until golden brown. 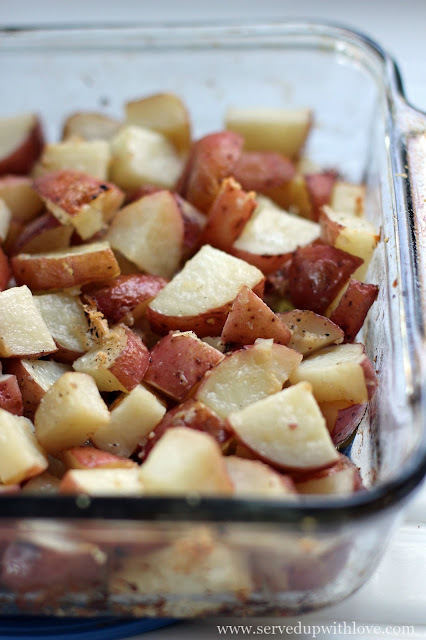 *Don't want to heat up the house, place only the potatoes in the microwave for 10-15 minutes before baking to reduce time in the oven. Then continue with the recipe and place in the oven for 20 minutes uncovered or until golden. Thanks Catherine for stopping by. These are not short on flavor. We look forward to seeing you again next week.